Home › Sprinkler Systems › When Should I Turn on my Sprinkler System? My customers call me and ask, “Dave, is it safe to turn on my underground sprinkler system now?”. Here in Colorado I have seen temperatures drop below freezing as late as June. Of course that is extremely rare. However it is not uncommon for Colorado to drop below freezing over night during April and often times, early May. That is all it takes to cause some fairly expensive repairs. 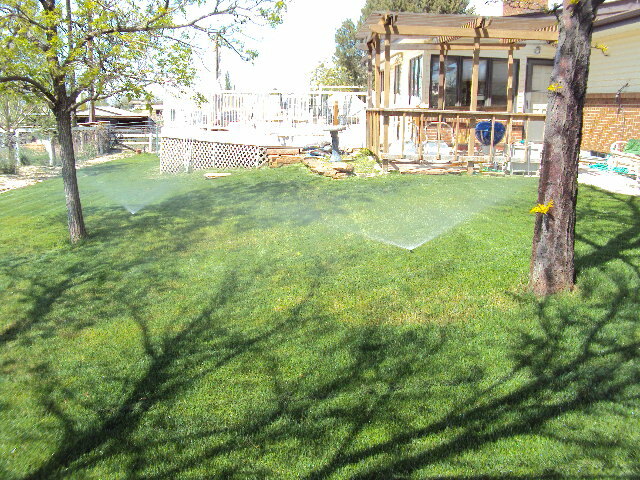 If it is a dry season, with little rain or snow, I recommend using the garden hose to keep dry spots green during the month of April. 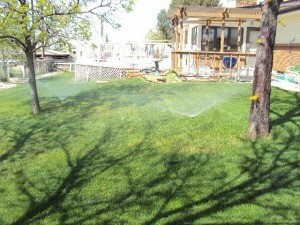 It is rather inconvenient to drag that hose around, I know, but start watering late April or early May. Because we tend to have the temp drop below 32 degrees in the month of April, once your system is activated there is still a slight chance we could freeze in May. So it is best to insulate your vacuum breaker or back flow prevention device. You can do this by wrapping it with old towel, rug or insulation (best choice) then cover that with a plastic bag. This will reduce the risk you take of freezing. It only takes 32 degrees for a short period of time to crack the popet and bonnet kit in your vacuum breaker. As soon as it thaws out is when you have the water running down the street or into your basement. Having your system wrapped will keep the ambient air from getting to the water in the pipes and reduce the chance of freezing. The best way to prevent freezing is to actually drain the vacuum breaker and manifold system. You can do this by turning off the main valve normally located in the house or at the curb. Then go over to your vacuum breaker and you may have a pea drain where the copper pipe comes out of the wall. Open that and let the water flow out. If not, open the drain inside the valve in the ground. Sometimes this in an automatic drain that you can not open or you have to unscrew a cap. Many systems have a drain that can be opened with a key or wrench at the end of the manifold. Use a screw driver to open one of the small test ports on the side of you vacuum breaker to create an air gap. Otherwise the water will not come out, just like when you open one side of a can with a can opener. Next go back into the house and open the drain valve or pea drain located on the turn on valve. This will get the water out of your pipes that are exposed to the cold weather. Some systems are auto draining as indicated above. In that event turn off the main valve and run a short manual cycle of each zone. This will open the automatic drains and allow the water to seep out. You will need to open one of the small valves on your vacuum breaker to allow air into the system. Now you should be able to drain the water from the vacuum breaker by going back to the main turn on and opening the drain located there. You will now be protected from freezing and it only takes a few minutes but can save hundreds of dollars in repairs. by, Dave Ferdon, Owner Operator of Thornton Sprinklers.